Experts in the chemical sector and dermatological lovers of this sport, have come together to create this fantastic product. Check all details on our online store! Gear up with the Neda el Món packs! Do you need to add some stuff to your open water gear? Check out the packs we have created for you in our online store and choose the one/s you like the most? Neda El Mon finalizes one more season with the Sant Silvestre race, which is celebrated on Sunday 17th at the beach of Mar Bella. A festive and christmasy day that the bravest swimmers will surely enjoy the most. The day will begin at 9:30 with the 1.500m race, and will continue at 10:30 with that of 2,500m. In addition, swimmers who need to add more meters can do the combined 1.500m + 2.500m, a great challenge considering that the water temperature is roughly 16 degrees in the coast of Barcelona. From yesterday the registration for this race are closed, but there are still 10 registrations available for swimmers who want to participate. Do not let the cold to stop you for swimming! Also, neoprene swimcap and neoprene socks come back to protect you on the colder months! Don’t loose the opportunity! Every year, they go fast! Want to take a selfie offshore, send a WhatsApp, make a call or control the GPS application? It is now possible with the new buoy with a cell phone pouch! You can put your cell phone inside of all our buoys without any risk, but with this one you can also interact with the touchscreen. And all this with the same security and visibility benefits than the other models! From November 21 to 27 you can enjoy the Black Friday week! Benefit from a 15% discount on all the products of our online store applying the BLACK17 code at the time of making the purchase. Sailfish, Zoggs, Icebug, Snacks, Nu Complements, Compressport, Safe Sea, Mugiro and, of course, the buoys ISHOF! Do not miss this opportunity, come here! You can find HERE everything what today needs to Swimrun! Sailfish wetsuits, Zoggs glasses, Icebug trail shoes, Compressport accessories and Nu Complements, Ishof buoys... the best brands to practise swimrun with safety, comfort and design. The second edition of the Swim Run Barcelona took place last Sunday, November 19th. It was a magnificent day where the participants united the towns of Cabrera and Badalona in the modalities of 32K and 21K, and the towns of Premià and Badalona in the 11K modality, following the coast of Barcelona-Maresme. This spectacular competition, the SwimRun, was born in the Nordic countries, in Stockholm. Since 2006 the SwimRun discipline has been growing at a great speed and has gradually reached our lands. Neda El Món has been a pioneer in organizing such a race in the Barcelona-Maresme coast and attracts both triathletes and swimmers. At an international level there are more than 180 SwimRun competitions grouped into various leagues, the most popular being the Ötillö Races. The SwimRun can be practiced individually or by teams, and it is about intercallating segments of short swims and runs without transitions. You have to use a wetsuits and your running shoes. Additional material such as pull-buoy can be carried out (to avoid lowering your hip because of the shoes weight) and training paddles (which also help you to swim). If you want more information about this test, do not hesitate to contact us at info@nedaelmon.com. Take advantage of the latest units and have a 15% off in wetsuits or accessories. The Ishof security buoy for open water swimmers is again available i on our website! Again available in our web the safety buoy Neda the Món for swimmers of opened waters! We have four models, Medium, Big, Big cell phone pouch and H2O to take along your stuff during the crossing I can access them, and three colors to choose, Orange, Pink or Yellow. Sailfish launches a new wetsuit ideal for swimrun competitions held in our country, with warmer temperatures than in the events held in Central and Northern Europe. With a 1.5 to 2 mm thickness, it's been specially designed to be lightweight and comfortable on the running segments, where the thicker swimrun wetsuits can hinder your performance by excessive heat and less freedom of movement. It is made of an innovative breathable neoprene material combined with woven textiles. It also has a front zipper with an emergency whistle included, adjustable neck, two interior pockets and one exterior pocket. On sale in our online store: The price is 199 €. Dear swimrunners, for this comimng season 2017, the super lightweight icebug shoes are now on our online store! They are minimals, lightweight, and have a great traction. All materials are very resistant and 'non-absorbent' so they do not increase its weight when they get wet on the swimming. The ground feel is remarkable thanks to the sole's low profile and its low drop. The pioneering and unique midsole construction causes an extra weight decrease allowing the natural movement of the foot such as running barefoot but with greater traction. The grip on all surfaces type is superior due to an optimized pattern designed on the sole. The newly developed RB9X rubber outsole patented by Icebug makes it more durable and gives you extra traction on wet, slippery surfaces. You also have the last units of the 2016 season at an unbeatable price with a 20% discount! Get ready to do the best on your swimruns this season! Do you want to follow the race in Medes aboard of Nautilus? On November 4 you can follow the swimmers of the 3.4K and 5.2K races aboard the Nautilus. Do not go without your seat and book your ticket here! The meeting point is in the Port de l'Estartit. From 10:15h to 11:15h you will be able to follow the crossings in a magical environment like the one in Illes Medes. The price per person is 8 euros (adults) and 4 euros for children under 16 years of age. La Finestra Sul Cielo joins Neda El Món as a Provider & Experience Maker in the 5th Neda El Món Illes Medes-Illes Formigues. The group created in Italy in the late 70's offers high-quality organic food and develops products that aim to improve the lives of consumers and the environment. La Finestra Sul Cielo makes products with ingredients that come from organic farming and does not use those containing chemical or synthetic substances in its treatment (such as insecticides, pesticides ...). In addition, it certifies that the raw material used comes from natural crops, is ecocompatible, and is free from GMOs, preservatives, chemical dyes and hydrogenated fats. In addition, all the elements used, from the seed to the final product, are certified by an officially recognized control body. That's why when you choose La Finestra Sul Cielo you can be sure that it meets all these requirements and that it safeguards for your well-being. Quality, commitment and 100% organic product! If you would like to find out more, click here. Do not miss tonight Temps d'Aventura, the sports program that is broadcast on Esport3 every Wednesday at 9pm. The program will feature a few minutes of the swim that Neda El Món organized last Saturday 23rd of September. Neda El Món organized the fifth edition of the swim that unites the Medes Islands, in L'Estartit, with the Formigues Islands, in Calella de Palafrugell, two unique natural parks located in the heart of the Costa Brava. It is a 22-kilometer swim that goes along some of the most iconic and beautiful points of the Girona coastline, such as the Far de Sant Sebastià, Tamariu, Punta del Mut, Aiguablava, Sa Tuna, Aiguafreda, Cap de Begur, Pals beach and the Medes Islands. Of the 99 swimmers who have tried it since 2013, only 50 have finished it. This shows how this swim can be very tough depending on the weather conditions, especially when the north winds are strong. This year, out of the 10 swimmers who have participated, only 4 finished after an 8-hour swim. Mental preparation is as important as physical strenght. If you want to sign up for the next year, write us an email here. The Neda el Món Swimrun Barcelona (Cabrera de Mar-Castell de Buriac-Pont del Petroli), Spanish Championchip, will give its participants the challenge to outperform themselves, running and swimming near one of the most beautiful cities: Barcelona. The race will take place at the Catalan capital’s coast, with two different starts, one in Cabrera de Mar and the other in Premià de Mar, and the finish will be in Badalona. The first race will go along the fabulous Castell de Buriac, in Cabrera de Mar. You can choose the team format or to participate individually. You can complete your registration HERE. Get yours from € 69 in our online store! Shipping costs to the Iberian Peninsula are free on orders of 50 € or more on our online store, so take advantage of it! Buy for you or for who you want to surprise the pink drybag you have your heart stolen, a pair of swimrun Icebug shoes or brand new Zoggs goggles! The 5th Neda El Món Illes Formigues - Illes Medes will take place on September 23, 2017. This is the longest crossing of all those held annually in Catalunya with a total of 22.3 km. It is a non-competitive journey that leaves aside the competitiveness to highlight the love of the sea and the open waters. The challenge is to unite Illes Medes and Illes Formigues; two spectacular and protected sites located in a wonderful enclave and separated by 22.3KM. Although the distance that is usually swam is between 25KM and 27KM. As explained, the route runs through a spectacular setting and you can see the most beautiful corners of the Costa Brava, such as Illes Formigues, Far de Sant Sebastià, Tamariu, Punta del Mut, Aiguablava, Sa Tuna, Aiguafreda, Cap de Begur, Pals and Illes Medes. Not forgetting all the coves that outline Costa Brava. If this year you do not have time to sign up, inquire about the registrations for 2018 at info@nedaelmon.com and ask us about the technical preparation we provide during the months prior to the crossing. Crossing the Strait is one of the most challenging swim for any swimmer. This particular crossing attracts swimmers from all over the world, but despite the fact that it is a short swim, its conditions make it tough and very complex. First of all, Neda El Món only accepts swimmers who can demonstrate through competition or crossings results a minimum pace of 3.0K per hour and the assurance that can come to at least 3 out the 5 training sessions scheduled in Barcelona. Neda El Món coordinates the crossing along with ACNEG, which is the association in charge of the channel. We are in contact with them throughout the year and they help us complete the crossing following the best currents and providing all the needed assistance to cross the Straits (medical services, 2 support boats and staff to supervise the swimmers). The pack that we offer includes ACNEG services, accommodation in Tarifa, online training sessions and 5 training sessions in Barcelona, as well as free participation in all our crossings (with a couple of exceptions). You can see the explanation here: https://www.nedaelmon.com/content/pdf/EstretENG.pdf. In addition, we allow up to 24 registrations and we make 6 groups of 4 swimmers. All swimmers who belong to a group have a similar pace. However, swimmers must be able to go at a pace 3.0K per hour. The groups are made in the training sessions scheduled in Barcelona, where we can see the different paces, and then create the groups accordingly. Afterwards, in the coming sessions, we tweak the groups until we have all the swimmers comfortably swimming together at (more or less) the same pace. Should there be any group of swimmers who request to go together, all the swimmers in the group must go at a similar pace or wait for each other, should they have any different paces. Levante gives way to Poniente after a few days of strong winds that have prevented us from crossing the Strait. On Monday we have a phenomenal window to try two crosses in a row. The first group is made up of Maria, Hugo, Óscar and Greg. When they are finished, Group 2, made up of Luis, Daniel, Serge and Karl. Two departures in a day coordinated together with ACNEG, the only association recognized to cross the Strait. Yesterday and today have been resting days… Easy swims and talks about the final details, like how to organize the feedings so as not to waste time - swimmers only have 1 minute to feed, since the currents drag them away from the track-. If everything goes well, eight swimmers will cross tomorrow. There still might be some degree of uncertainty about the weather, but plenty of confidence that the work done by all these swimmers tomorrow will see its fruits. As you know, it starts a new season at the CLUB ESPORTIU NEDA EL MÓN. Starting Monday, September 4th, the training sessions will be resumed following the summer dynamics, combining training at Espai de Mar and the Bernat Picornell Swimming Pools. You can see the hours below. From our side, we want to let you know that we start this upcoming season with great energy so that each and every one of you can achieve specific goals with the help of our two coaches, Marian and Boris. Do not hesitate to set yourself small or great feats and share them with us! We also want to remind you that we have programmed a number of events in the calendar that can be used as an extra motivation after this relaxed August. * For the first 2 weeks of September, from the 4th through the 15th, the Monday and Wednesday training sessions will take place from 8pm until 9:30pm. This morning Africa seems blurred. Towards there will be directed from Tarifa the 22 swimmers that will make this crossing between the days 1 and 17 of September. The Strait of Gibraltar expands from the Spanish coast (Isla de las Palomas) to the African coast (Punta Cires) 16 kilometers, if the current lets us swim the shortest distance between both points. If it is strong they can leave up to 22 kilometers. In addition to the currents there are other issues that concern swimmers, such as the animals that live in these waters - there is a family of orcas that lives nearby - and the temperature of the water that oscillates between 15 and 19 degrees. So crossing the Straits is a challenge. Or rather: THE CHALLENGE. In uppercase. But the CHALLENGE is not just to cross. Crossing is beautiful and fun, it's "the goal" of the season ... The real challenge is the commitment and involvement of swimmers for months to train, and to reconcile work, personal and sports life. This is difficult. Much more than doing laps at 1:30, 1:20 or 1:50. All of you have had training sessions at untimely hours in the morning (or at night); or you have arrived late at a dinner party (or you have not even reached it). Surely, many of you have been through the "I-have-a-10K-training-session-Sunday-morning" moment with your partners or relatives, who, sometimes, might have reluctantly answered "it's okaaaaaaaaay" -with a long a. But in the end here they are, sharing this adventure with you (even if it is from home in some cases) and sure telling everyone that you will cross the Straits, while they have a half smile on their faces. Seeing the whole panorama ... Let's hope the Strait let's be crossed in the first two weeks of September. Good luck to everyone and Swim the World! Follow this adventure on Facebook! It is not yet on sale, but you can book it now in our online store. The price is 199 €. Swimming around the Medes Islands is spectacular. Every year Neda el Món organises a challenging crossing in a spectacular surrounding, the protected area of the Medes Islands. Since 2011 the crossing starts at the small Estartit beach, we swim between the big and the small Meda Island and finish again at the small Estartit beach. Altogether 5,200m, there is also a shorter version of 3,400m and another for new swim addicts, the swim baptism, a 1,700m-swim, ideal to be released and to be accompanied by an expert swim addict. The swims will be held November the 4th, but if the weather won't be enough good, the swims will be on November the 5th So, swimmers need to block the whole weekend. Have your Yellow Chip for your athletics events! The yellow chip has three main advantages: forget queues, make online registrations to different events and join the ChampionChip Internet League. You can buy it when registering to a Neda el Món event and it'll be delivered on the day of the event, or via our online store to use in any event. In that case we will send it to your home/office. That way you'll avoid having to rent white chips, which are disposable, and queue to pick them up the day before. The yellow chip is personal: you can subscribe to the event via internet with the code associated to the device. It does not expire, does not need any reload, and unlike other timing systems, it generates no waste. You can also check your results online, your history of past events and personal brands, as well as participate in the ChampionChip Internet League. The Compressport® Chipband is the perfect solution for securing your timing chip. Snackissimo is a 100% all natural fruit snack. It's for athletes, as a snack between hours or to bring on your trips. Each 18 gr bag of snackissimo is made with 126-132 gr of fruit (a mix of apples, pears and strawberries) from where water has been extracted and has rapidly concentrated. Acquiring the texture from the fruit pectin. Surely many of you suffer muscle ramps at some point during a swim or an intensive training. But do you know the reason why it happens to you? During the sports practice, our muscles shrink and relax to be able to swim. At the time of contraction there is no problem, but ... what happens when the muscle relaxes? For the muscle to relax it needs electrolytes or minerals such as sodium, potassium, calcium ... If you do not have enough of them to reach relaxation, the ramp occurs. So the ramp is the inability of the muscle to reach muscle relaxation due to a lack of minerals or electrolytes in the blood ,either because we have not ingested enough of them or because we have made a sustained effort and we have consumed the reserve we had. What if I have a ramp? What do I do? The easiest way to proceed is to strech muscles affected very carefully. Then apply massage and very soft stretches to fully recover. And most importantly, how can I prevent it? With ingestion of minerals in the diet and isotonic drinks. If they still persist or do not improve with immediate stretching, it is important to see a doctor. On Monday, July 17th, one of our swimming coaches, Marian Garcia Aguado "Bombom", provided some tips for open water swimming. Marian was a water polo from a young age, since she became an open water swimmer as a grown-up. Marian told us how to train open water swimming from her own experience. 1- Sensations. You train to swim in the sea, so you have to train at the sea, without leaving the pool. 2- Dry-land training. It is very important to combine swimming training with two or three weekly dry-land workouts. She recommends doing them before entering the water, but every person is a completely different world. 3- Technique. Train the technique to the pool. It will help you improve the body's position on the water and therefore slide more, and as a result you will go faster. 4- Feeding. Try the bars / gels / isotonic drinks during training to see if you tolerate them well. During the crossings is not time to try new things! 5- Loads. Quality above quantity! If you train for a 10K, for example, you do not need to add 20KM per week. What you should do instead is a load of 15KM or 16KM with dry-land sessions. You do not have to go crazy with the loads! If you want to come a day to train with us, you can see the schedule here. In September the club activities will be resumed! We are waiting for you! Do you want to know how the Neda El Món safety dry bag works? Do you want to know how the Neda El Món safety dry bag for open water swimmers work? Do not miss this video! Its slippery texture makes it difficult for the stinging tentacles to get a grip. Chemical (stoppers) in the lotion block up the sites where the stinging process is activated. Chemical stoppers reduce pressure in the stinging cells, preventing the jellyfish from firing its stings. Safe Sea prevents the stimulation of jellyfish tentacles after contact with the human skin. UVB / UVA Protection. Safe Sea contains physical, chemical and biological filters which reduce the effects of solar radiation on the skin. Very water resistant. Clinical trials have proven that Safe Sea is very water resistant, enduring up to 80 minutes of aquatic activities. In case of minimum contact with water, Safe Sea's protection is prolonged. Preservative-free. Safe Sea’s formula is sterile, so there’s no need for toxic preservatives such as parabens. Water-in-Oil emulsion. Safe Sea’s Water-in-Oil emulsion gives the skin an excellent feel and keeps it hydrated. Contains vitamins B and E. Vitamins B and E, which are present in Safe Sea, are important antioxidants for the human body. With Bioplasma, GAG and Glycoproteins. Safe Sea’s formula contains Bioplasma-FA, the plankton extract with patented sting inhibitors. Together with GAG and glycoproteins, they improve the skin’s hydration and have anti-aging and anti-stress properties. Available in two different formats in our online store. Participate in the 4x800 relays with three friends! Come to Estartit with your friends and enjoy swimming more than ever! Neda el Món has prepared an open water festival, the weekend of the traditional Neda el Món Medes Islands TV3 Marathon crossing. You will be able to enjoy open water swimming in a marvellous surrounding and with good company. It will be a relay race. You will have to swim 800 m four times. Ask 3 friends to come with you, form a team and pay only 19€ per team HERE. Participation in this race does not prevent any swimmer from participating in the other crossings. Once you have registered, please send a mail to info@nedaelmon.com, stating the name of your team and the names of the other 3 team members. Here's an article by Red Bull about epic girls! At Neda El Món, for the time being, we will keep swimming in throughout the Catalan and Spanish coast...! All swimmers who are members of our club and have a STRAVA account you can now connect with the Club Esportiu Neda El Món and share your training sessions, swimming routes and more with all of us. The only thing you have to do is visiting this LINK and ask for your membership in our online community. With this app you can start conversations and discussions with other club members, plan swims and meetings, share training routes and from the club we will let you know all the activities that we are planning for all of you. Join us in our online community! Trainning for a long distance open water swim (that is crossings of more than 10 kilometers) involves a great deal of physical and mental preparation. The crossings of the Straits of Gibraltar, for example, or the Medes-Formigues, require careful planning at a physical level (yardage, compensatory exercises, rest, acclimatization to water ...) but also at a mental level (if the brain disconnects, the muscles will fall apart, too). For this reason, when we organize "marathon" swims, we prepare our swimmers and provide them with online and face-to-face training to track their performance and advise them on how to improve aspects that worry them. For both the 22KM crossing, Medes-Formigues, and the crossing of the Straits of Gibraltar (16KM), we have a specific training program for the swimmers involved so that they achieve their goals. In fact, most swimmers who participate in these two crossings with us finish them successfully. This Saturday, July 8th, the groups that participate in the swims mentioned above will participate in the 16KM training that unites El Masnou and Badalona. So from here we wish them ALL THE BEST! MEDES: Free registration for the little swimmers! Before we start talking about how to make your son or daughter fall in love with open water swimming we must clarity that the main goal of participating in such events should be having fun! In all of our crossings we include a Kids Open Water Crossing so that from an early age they learn to love the sea and find enjoyment in swimming in an open water environment. In that regards, the Medes Junior is the kids version of the non-competive Neda El Món crossings. It is a leisure and free activity set up to promote open waters from a young age. In this year's event, every kid will be able to register for one of the crossings of 50m, 100m and 200m. And as it happened in Swim Barcelona, if parents want to join their kids while they swim, they can do so. Please, feel free to can register the little swimmers here. Neda el Món safety dry bag, now in pink! What about adding some pink to your open water swims and workouts? Visit our online store and choose your size. It is available in 64x30 cm and 60x26 cm. And also in yellow! The Neda el Món security buoy for open water swimmers is also available in yellow! You will not go unnoticed. Zoggs, the favorite brand of open water swimmers and triathletes will be the new title sponsor of the 2nd Neda El Món SwimRun Barcelona which will be held next November 19th in Barcelona. The swimming brand Zoggs and Neda El Món have reached a sponsorship agreement to collaborate in what will be the second edition of the only swim run organized in the coastal area of Barcelona. The 2nd Neda El Món SwimRun Barcelona, a scoring event for the SwimRun Spain Championship, will take place in the Catalan coast of Barcelona with departures from Cabrera de Mar and Premià de Mar and arriving in Badalona. Participants can sign in groups or individually in three different distances of 32K, 21K and 11K. Get a new Sailfish wetsuit now with a 10 % discount! Gear up for a great open water season with the Sailfish wetsuits, now with a 10 % discount in our online store! Well known for their high degree of flexibility, excellent balance of buoyancy as well as superior hydrodynamics, the Sailfish wetsuits are loyal to their motto: “made to make you faster”. Enter the code JXCB5 when paying for the discount to be applied. Promotion valid for all models except Current Blade, Rebel and Swimrun Light. Take advantage of it! Take a trip to Illes Medes by swimming! Use the code MEDES17 and enjoy a 25% discount on the registration fee. This promotion is valid until the 200 first swimmers enrolled. On November 4th we will be waiting for you in L'Estartit to participate in the 8th Neda El Món Illes Medes Marató de TV3. This year Neda El Món offers three different distances: 5,700m, 3,400m and 1,700m plus the 4x800m relays. The 26th edition of the Marató of TV3 is celebrated on Sunday, December, 17th, and is fundraising money that will be used to fund several research projects dedicated to find a cure for group of diseases that cause one in three deaths worldwide, and that according to experts, will become a serious public health problem. Help us raise money and participate here! Visit our online store and choose your size. It is available in 3 colours (orange, pink and yellow) and two sizes, 64x30 cm and 60x26 cm. A 1,000 children and adolescents living in Catalonia are affected by different diseases that in many cases make their death predictable and have specific palliative needs. The professionals of the field and many families are asking for the creation of a specialized support network that can handle the complexity and the palliative needs of children under the age of 18. David Sullà, Masters' Swimmer of Club Natació Catalunya, has proposed to join his sporting challenges with a solidarity challenge: to raise funds for the project "Cuenta conmigo". The crossing of May 28, the 7th Neda El Mundo Swim Barcelona, was part of his calendar of open water crossings. Together with professionals from five reference hospitals, Fundación Enriqueta Villavecchia has worked on the proposal to create a support network that can provide better care and support these families, in a comprehensive way, for all the children affected by any disease, not only oncological, throughout the Catalan territory. Since the beginning of this year, Fundación Enriqueta Villavecchia has already put in place a psychosocial care team that serves the children and adolescents of different hospitals, especially in the domiciliary area. The project is called "Cuenta conmigo", and David Sullà, who knows the project, has launched a campaign to fundraise through crowdfunding. The campaign began on May 5th and the donations are given through the web page "Mi grano de arena: https://www.migranodearena.org/es/reto/15480/compta-amb-mi-nedo-per - you / ". From Neda El Mundo we want to thank David Sullà for having "counted on us" for this noble cause, and from here we wish him and his cause all the best! Cross the Strait with us in September! One of the greatest chanllenges for an open water swimmer is crossing the Strait of Gibraltar. Neda El Món has helped many swimmers crossing the strait.In 2012, 12 swimmers succeded, 20 in 2013, 21 in 2014, 22 in 2015 and 23 in 2016. This year we would love to help many more swimmers complete this adventure! If you would like to join us in this adventures, see all the details here. El Quinto Meta is the Official Physiotherapist provider of Neda El Món. After each race they help your muscles recover from the swim to prevent muscle pain through manual techniques and stetching. Besides, they always provide great advice on how to prevent injuries. The team of El Quinto Meta is giving you, until June 30th, an exclusive promotion* for all the swimmers who took part in the competition last Sunday, which consists of a 45 minute treatment for only 20€. Now that the 7th Neda El Món Swim Barcelona has come to an end, please, make sure to check the results below. We hope to see you in Sa Dragonera on June 17th! Barcelona, May 25th, 2017. Maria Rossell (27) took over as Executive Director of Neda El Món on May 15th. The 27 year old woman from Bescanó (Girona) majored in Audiovisual Communication in Universitat Pompeu Fabra (2012) and took her master's degree in Sports Industry Management (2015) at Georgetown University (Washington, DC). She also joined the Entrepreneurship Development Program in the Massachussetts Institute Technology (MIT) in Boston on January 2017. Right after working for the Organizing Committee of the World Swimming Championships in Barcelona (2013), and after completing her master's degree, Rossell took over a role in marketing and communications at DC United, a Major League Soccer (MLS team. During the last year and a half, has been working as a Corporate Hospitality Coordinator in Dorna Sports, the company that runs the MotoGP Championship. Rossell, swimmer and passionate about open water from a young age, takes the new role, as Marc Caballé steps down after seven years running operations in Neda El Món. The new Executive Director has praised the job done by Caballé throughout all these years and has highlighted the "pioneering endavour of Neda El Món as organizer of open water swimming events". Also, she has added that takes on this responsibility "with lots of enthusiasm and with the idea of revitalizing the project and consolidate it, keeping the values that characterize Neda El Món, which are the please for swimming, the sustainability, the respect towards the natural environment and the desire to promote open water swimming". Neda El Món will continue offering crossings for swimmers of all ages and levels so they can enjoy the spectacular natural landscapes such as Sa Dragonera (Mallorca), Isola Madalena (Sardenya) or Illes Medes, among many others. May 28: 7th Neda el Món SwimBarcelona by Wetness! Swim addicts! Only a few weeks left for the th Neda el Món SwimBarcelona by Wetness that will take place on May 28 in Barcelona! Want to take a selfie offshore, send a WhatsApp, make a call or control the GPS application? It is now possible with the new Neda el Món buoy with a cell phone pouch! Hey! We're going to Sa Dragonera. Are you joining us? June 17th: save the date because the 7th edition of the Neda el Món Sa Dragonera swim will be held that day! Enjoy with us the crystal clear waters of this island of Mallorca. The Nature Reserve is formed by three islands: Pantaleu, Mitjana and Sa Dragonera; besides it has an important Area of Marine Influence that contains part of the resources that uses the fauna of the littoral of the park. It is separated from Mallorca by a small channel (800 m) which is not really deep and has sandy floors covered by Posidonia oceanica, a real underwater forest, which serves as a refugee of many marine species. 2nd Neda el Món Swimrun Barcelona by Wetness: registrations are now open! Registrations for the 2nd Neda el Món Swimrun Barcelona by Wetness are now open! All details on this link. It will take place on November 19 and you'll be able to choose amongst 3 distances either individually or in pairs: 32.830 m - 21.470 m - 11.910 m.
Swimrun is a trial in which multiple running tracks are combined with multiple open water swimming sections without interruptions. It has become very popular In the Scandinavian countries since 2005. 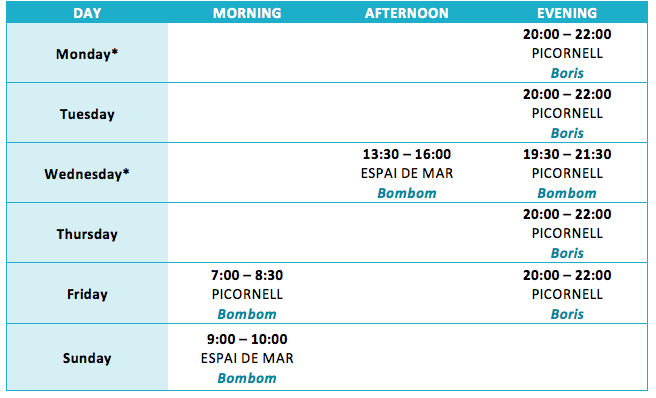 Neda el Món Club: new schedule and more sessions in the sea! Do you want ant to improve your swimming technique and enjoy more of each swim? Join the Neda El Món Club! With group sessions at the Bernat Picornell Swimming Pools, 20% discounts on the Crossings and Clinics of our calendar, group outings to swim on the sea and now also swimrun sessions! Make a major step forward in your open water performance! We've created a Premium version of the Neda el Món Sa Dragonera swim. By choosing it you'll have a kayak available only for you, which means you won’t have to adapt to the rhythm of any group. Are you interested? All the details on this link! Registrations are open for the 7th Neda el Món Sa Dragonera swim! June 17th: save the date because the 7th edition of the Neda el Món Sa Dragonera swim will be held that day! Enjoy with us the crystal clear waters of this island of Majorca. You'll see this year there are some modifications compared to previous editions, since it will be a much more personalized event. Registrations are open for the 1st Neda el Món Swimrun Delta de l'Ebre! The event will take place in Delta de l'Ebre (Tarragona) on June 4th, starting and finishing in Riomar and passing through incomparable natural places. Click here to see all the details and mark the date on your calendar! If you also want to get ready with us for this adventure join the Neda el Món Club! Swimming workouts in the sea and the swimming poll and also swimrun workouts for you to become a better swimmer and swimrunner. 2nd Neda el Món Swimrun Barcelona by Wetness: early bird discount! Registrations for the 2nd Neda el Món Swimrun Barcelona by Wetness are now open! Sign up before March 31st and take advantage of an early bird discount. All details on this link. Plan your swim and swimrun season! Take a look at our calendar and start now planning for the season! Great weekend in Calella at the Neda el Món Training Camp! Thanks to all those attending the Neda el Món Training Camp for such a fantastic weekend! We hope you have enjoyed and learned a lot and are even more motivated for a fantastic open water season! Thanks also to the excellent teachers who shared their valuable knowledge with us: Marian García, Roger Pérez, Noemí Prieto (El Quinto Meta), Fernando Castillo and Loli Medina. And of course thanks to the Crol Centre Calella for leting us enjoy its fantastic facilities. Do you want to keep learning with our technical team? You couldn't make it to the Training Camp and all those pictures on our social networks made you jealous? No problem, Neda el Món's training provision never stops! Join the Neda el Món Club and enjoy with us of workout sessions for open water swimmers in the swimming pool and in the sea, and now also swimrun sessions! Looking for a great gift for Father's Day? How about sharing a swim with him? How about giving him a Neda el Món swim registration for you both to swim along together? Or a Neda el Món gift voucher for him to get some new swimming gear? 3a Neda el Món SwimBarcelona Sant Silvestre from Neda el Món on Vimeo. Do not miss the video of the 3rd Neda el Món SwimBarcelona Saint Sylvester that was held last January 8th!